Happy Saturday ladies and gents! I'm a big fan of Glass House Press, and all the things they do. Their authors are amazing, and so I always rush to give them any promotional space they ask for. Plus, I can't deny I'm a sucker for a good cover. Are you ready for some cover love? Glass House Press is proud – and slightly giddy – to announce Tash McAdam’s latest YA Fantasy novella, BLOOD IN THE WATER – the first in the Warp Weavers series! 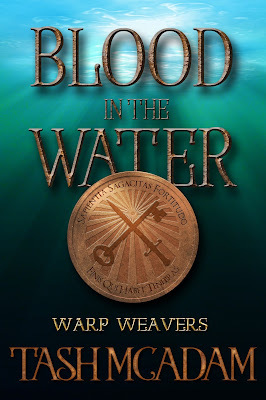 BLOOD IN THE WATER is Glass House’s first book by a queer author, and features brand new LGBTQ characters and storylines. We’re very excited about this novella, and hope you will be, too! Sea Serpents. In the Thames. The problem is, the warps are underwater. And the sea monsters are hungry.